It is great to be in Crete, Nebraska! Crete has always had a special place in Valentino's development. 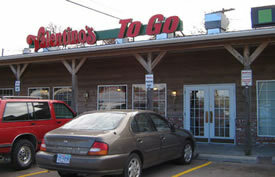 Located only 25 miles from Lincoln, Crete residents grew up with the taste and tradition of Valentino's. In 1999 a franchise was established to serve the Crete area. Since opening, the store has gone through various growth spurts and today is stronger than ever offering a highly decorated dining area and the finest and fastest express menu in the restaurant industry. So if you are thinking of a quick Italian express lunch, or a comfortable dining experience, try the Crete Valentino's --we're sure you'll enjoy the visit. The Crete location is owned by Travis and Kimberly Sorensen. The Sorensen's are hands on operators; ensuring Valentino's quality, cleanliness, and customer satisfaction are carried through daily. It is not unusual to see one or both of them kneading your pizza, taking your order, or cleaning your table. The Sorensen's are multiunit operators and chose Crete as their second location, welcoming the opportunity to get to know the community and the people. The Sorensen's are committed to making the Crete Valentino's one of the very best stores in the system.